Fold in short sides of dough by 1 inch, then fold in long sides over each other, overlapping in the center. Pinch to seal. Carefully flip dough over so the seal is on the bottom (if you’re nervous about this step, skip it: The stromboli just looks prettier with the seal on the bottom, but it’s not necessary). I’m in love with stromboli and I don’t care who knows it. 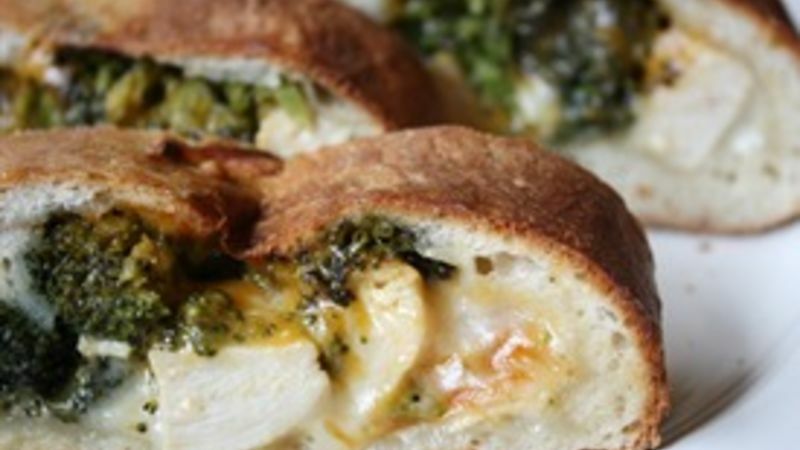 Yes, it was love at first sight with this yummy Mushroom Fontina Stromboli, but when this Cheesy Chicken and Broccoli Stromboli came along my fate was sealed. I was never going stromboli-free in my life again. It’s insanely easy to make. Fifteen minutes max is all the time you need to get this dinner (or side dish) in the oven. And 20 minutes later, it’s time to eat. It’s delicious. Pizza is one of my favorite food groups, so having a meal wrapped in a crusty, chewy pizza dough is enough to make me weak in the knees. It requires few ingredients. Of course, you can put as many things as you want in your stromboli, but a little bit goes a long way, so it’s economical, too. I love the combination of warm, melted sharp cheddar and mozzarella cheeses, roasted and slightly crisp broccoli and juicy bites of chicken in this recipe. And though making stromboli once made me fearful – would there be too much crust and not enough filling? Would the filling spill out of the bottom leaving me with a pizza crust skeleton and a lovely mess of cheese on the side? (neither of which has happened, by the way) – I decided to forge ahead anyway. And I’m glad I did, because (as you can tell above) my life is changed for the better. OK, so stromboli isn’t the be-all, end-all of foods. There are plenty of things I like just as much. But when you’re a busy bee and can still have a delicious and economical meal or side dish on your table in about 30 minutes, well, few things are more lovable than that.